screenshot2.jpg​ (358.5 KB) - added by Hubert 10 years ago. netsurf_crash.txt​ (4.2 KB) - added by Kev 7 years ago. NetSurf-4794-debug-20-03-2013-03-25-56.report​ (5.3 KB) - added by Kev 6 years ago. That's not a bug actually. NetSurf makes use of translators and these are loaded as add-ons into the address space of the application. Since they are GCC4 on a GCC4 install and you cannot mix GCC2 and GCC4 binaries, this is equivalent to not having any translators installed. It's not a crash either, it's just a bit of a strange error message. Wouldn't it be possible to have gcc4 compiled version of translators in /boot/beos/system/add-ons/gcc4 and makes gcc4 bins use them from it. I suggest putting GCC4 add-ons on a subdirectory, instead of GCC2 ones, because for R5 compatibility, legacy apps expect to find add-ons on /boot/beos/system/add-ons/, so legacy add-ons (legacy means GCC2 compiled) should be in /boot/beos/system/add-ons/, and new GCC4 add-ons should then be relocated in a "gcc4" subdirectory. 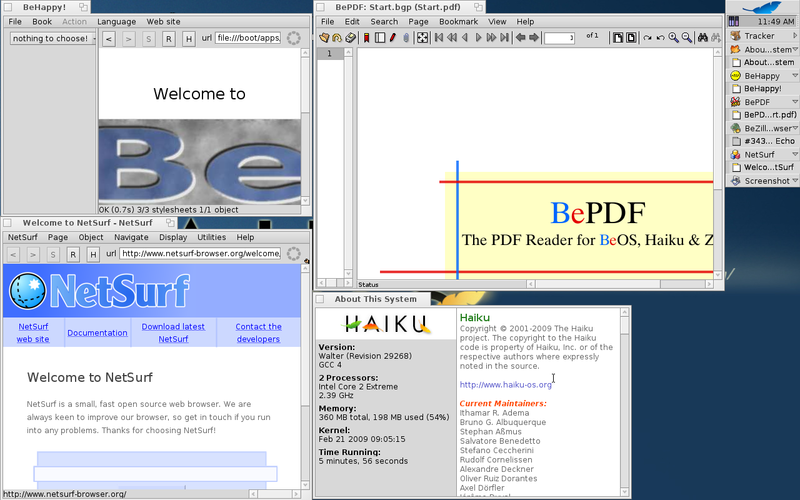 This would allows to use GCC2 apps that make use of add-ons on a GCC4 compiled Haiku with GCC2 libs (hybrid build). Is that a realistic suggestion?? Ok I verified my suggestion and it should work. So it seems that even if the subdirectory suggestion wouldn't be faisable, installing GCC2 version of Translator with for example a "-gcc2" part in their names on the /boot/beos/system/add-ons/Translators/ will work. I've also veryfied the last solution. I copied the GCC2 version of Translators with -gcc2 name (e.g: BPM-gcc2Translator) in /boot/beos/system/add-ons/Translators/ and it works also. So a very quick fix to this issue (as it's not a bug), would seemly to include the installation of GCC2 Translators with "-gcc2" included in their names on /boot/beos/system/add-ons/Translators/ in the GCC2 additional library build process in a GCC4/GCC2 haiku build process. I hope you will consider this suggestion, as it works, and allows to offer a better R5 compatibility (as good as with a GCC2 build? Maybe!!) in GCC4/GCC2 hybrid Haiku builds. That method however will quite likely break gcc4 apps that try to use translators in the same install. Fresh install, just did installoptionalpackage netsurf, and the symlinks. BTW, the log has my processor wrong, I just noticed. It's a Sempron 3100+. Not sure if that makes any difference. If necessary, let's pick this up again if a new NetSurf package becomes available, or when at least the versions of the tested software in question are known and stated in the ticket.